Rwanda’s variable and changing climate is an increasingly serious challenge to the country’s agricultural sector and farming population. Climate information services are emerging as a means to support farmers to manage risk and provide an opportunity to build the resilience of agriculture to climate at all time scales. Climate services include historical, monitored and forecast information, and value-added information products such pest and disease risk warnings, crop yield forecasts, or management advisories. The new Rwanda Climate Services for Agriculture project, funded by USAID, aims to benefit nearly one million farmers by 2019, and transform Rwanda’s rural farming communities and national economy through climate services and improved climate risk management. This desk review was conducted to ensure that the project design is informed by and builds on existing needs, knowledge, services, capacities and initiatives. It synthesizes what is known about climate-related risks and their impacts on Rwanda’s agriculture sector; the current status of climate information products and services; key institutions currently involved in the production, communication and use of climate-related information; and communication channels that can be used to deliver climate information services to relevant users including Rwanda’s farming population. Nyasimi M, Radeny M, Hansen J. 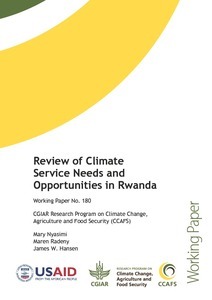 2016. Review of Climate Service Needs and Opportunities in Rwanda. CCAFS Working Paper no. 180. Copenhagen, Denmark: CGIAR Research Program on Climate Change, Agriculture and Food Security (CCAFS).